strokeofluck: Marriage equality legal in New Zealand:- about time. Marriage equality legal in New Zealand:- about time. 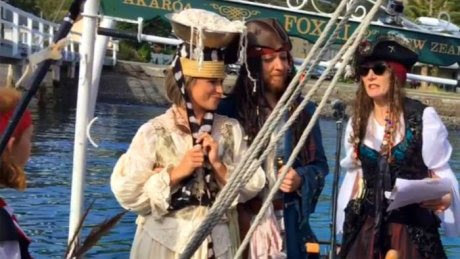 The Church of the Flying Spaghetti Monster has held its first legally recognised marriage, with the offbeat movement hailing the New Zealand ceremony as a world-first milestone toward acceptance. Church adherents call themselves pastafarians, wear colanders on their heads, revere pirates and believe the world was created by a deity made of spaghetti. But while they have a love of pasta-based puns and celebrate holidays such as "Talk Like a Pirate Day", followers insist their religion is no joke. New Zealand officials agreed, and gave Wellington-based pastafarian Karen Martyn the legal right to conduct marriages last month after ruling the church was based on genuine philosophical convictions . Ms Martyn conducted her inaugural wedding as an ordained "ministeroni" on Saturday, when Toby Ricketts and Marianna Young became the first couple in the world to "tie the noodly knot" in a legally recognised ceremony.